With the sailing season rapidly approaching, Halcyon Yachts are busy helping clients relocate their vessels for a summer of use.We have a Jeanneau 45 DS on route to Gibraltar from The Solent. This is an owner assisted passage that we have crewed with two Ocean Masters. 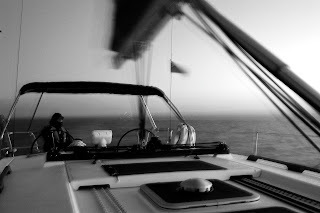 The Skipper is a very experienced Yacht Master Instructor and will be offering advanced training to the owner and his wife so that they can continue on and have a wonderful summer of Mediterranean cruising. Professional yacht delivery with a personal touch!